Bicycling is an increasingly popular form of commuting, recreation, exercise and sport, with about 80 million cyclists in the U.S. Still, no one who rides a bicycle is immune from the possibility of injury. At The Law Offices of Jeffrey S. Glassman's BikeAttorney.com, our Boston bicycle accident lawyers know the increasing popularity of cycling in the city has increased the possibility for accidents. Boston city officials report more than 90 percent of bike-related injuries involve a bicycle and a car. Data from the Boston Police Department shows bicyclists are disproportionately injured in these crashes, compared to motorists. That’s largely because cyclists aren’t shielded from direct bodily impact. They don’t have seatbelts and there is no windshield, doors or bumpers to protect them. Even at low speeds, these injuries are often serious and can be fatal. Data from the Centers for Disease Control and Prevention (CDC) show bicycle injuries result in lifetime medical costs and productivity losses of about $10 billion. 98 percent of all those injured in bicycle crashes were bicyclists, even though they accounted for 53 percent of the people involved. 2 percent of those injured in these collisions were drivers, even though they accounted for 46 percent of those involved. 2 percent of those injured in crashes involving bicycles were pedestrians, though they comprised just 1 percent of all those involved. Most of the time, cyclists either refused transport or, if they were taken for medical attention, they were transported by Basic Life Support ambulance. However in 7 percent of cases, cyclists had to be transported for emergency medical care via Advanced Life Support (helicopter) or were referred to the local medical examiner (in cases of fatality). Keep in mind, these are only those incidents to which EMS responded. Others may not have contact EMS, either because the injuries weren’t serious or they transported themselves to the hospital. There are a lot of injuries, particularly in sports, that tend to come on gradually – a torn rotator cuff or a stress fracture. But cycling is different. There are some so-called “overuse injuries,” but more commonly, there is a definitive event – a before and an after. One of the biggest concerns for cyclists is the risk of a head injury. The CDC reports only about half of all cyclists wear helmets. Worse, only 48 percent of children between 5 and 14 wore bicycle helmets when riding, with older kids less likely to wear one than younger kids. Researchers found that between 22 and 47 percent of bicyclists who suffered injury had some type of head trauma, and that usually involved a collision with a motor vehicle. Head injury caused by impact with a motor vehicle was responsible for 60 percent of all bike-related deaths and also the majority of serious injuries resulting in long-term disability. Neck trauma, although rare, is also usually serious when it happens and usually is the result of colliding with a car or other vehicle. Cyclists who ride on-road as opposed to off-road are 40 percent more likely to suffer injury to the head, face and mouth. Of the 741 cyclists killed in the U.S. in 2013, the NHTSA reported more than 60 percent weren’t wearing a helmet. Street cyclists can’t control the design of the road or the actions of motor vehicle drivers. They can, however, protect themselves by carefully mapping out their routes, donning protective gear, staying alert and obeying all traffic laws. 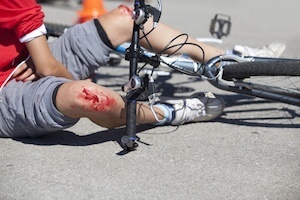 Because of the enormous impact a bicycle injury can have on one’s life and/or their family’s life, it’s important to discuss your legal rights with an experienced bicycle accident lawyer in Massachusetts.